In the fall of 2015, the National Fire Protection Association (NFPA) issued its first edition of NFPA 652: Standard on the Fundamentals of Combustible Dust, 2016 Edition. This new standard establishes the relationship and hierarchy between it and the industry specific standards (NFPA: 61, 484, 654, 655, 664) to ensure that fundamental requirements are consistently addressed across industries, processes and dust types. Below is a summary of how this standard affects you and your combustible particulate solids handling process. 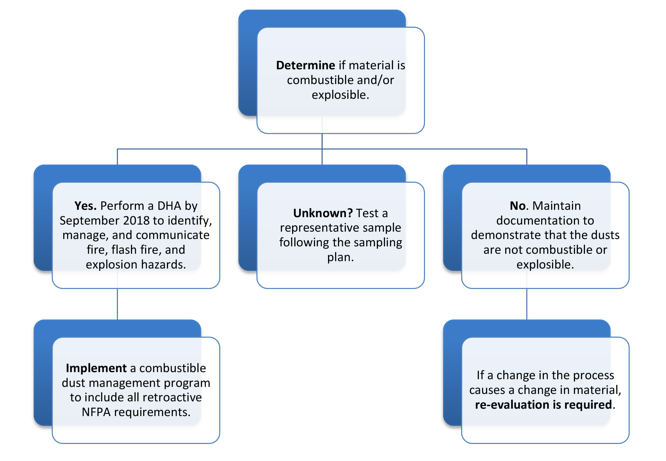 The owner/operator of a facility (you) with potentially combustible dusts is responsible for determining whether the materials are combustible or explosible. The absence of previous incidents cannot be used as the basis for deeming a particulate to not be combustible or explosible. Any facility handling/generating dusts, powders, or materials that during processing are found to break apart into smaller pieces may in fact be dealing with a combustible particulate solid. This means that these facilities are required to determine if the material they handle is combustible or explosible. If so, the owner/operator (you) is responsible for characterizing the properties of the material as required to support the Dust Hazard Analysis (DHA). The DHA must then be completed within 3 years of the effective date of this standard (by September 2018). (2) Analysis of representative samples by testing. It should be noted that a material can be combustible but not explosible, explosible but not combustible or both combustible and explosible. If the combustibility or explosibility is not known, determination of these properties must be determined by standard-specified tests. These tests must be performed on representative samples based on the sampling plan. The location of sampling is critical to obtaining meaningful results. The finest particles in your process represent the highest hazard. These tend to collect in dust collectors and on elevated surfaces. It is permitted to assume a dust is combustible and/or explosible and proceed with all protections mandated by the standard, negating the need to perform the determination. However, further testing will need to be conducted in either case in order to determine the necessary safety protection systems specific to the material and process. The findings (test results, historical data, and published data) shall be documented and, when requested, provided to the authority having jurisdiction (AHJ). 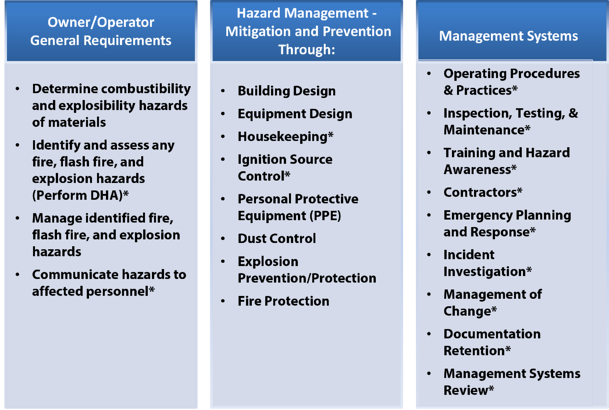 Your AHJ may include OSHA, your insurance company, or your fire marshal. identified fire, flash fire, and explosion hazards, and communicating the hazards to affected personnel in accordance to the standard. If explosible dust is present in your facility or handled in your process, several management systems need to be in place to manage this hazard. Implementing a combustible dust management program will include all of the retroactive requirements of NFPA 652 (Figure 2). in supplier, etc.) or its environment (temperature, residence time, exposure to gases or other materials, etc. ), new testing may be necessary to determine if the combustibility and explosivity properties have changed and what, if any, precautions are now required. 1. NFPA 652 (2016) Standard on the Fundamentals of Combustible Dust, 2016 Edition. NFPA, Quincy, MA.